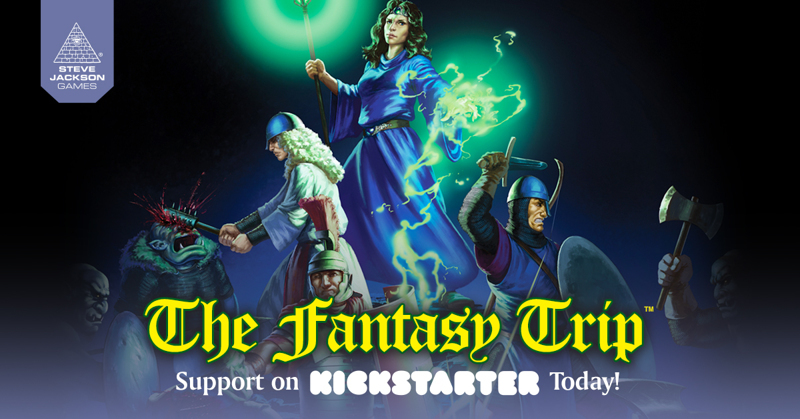 Daily Illuminator: The Fantasy Trip Is Back, On Kickstarter Now! July 25, 2018: The Fantasy Trip Is Back, On Kickstarter Now! After more than 35 years, the dungeon is open: The Fantasy Trip has returned, in a new Kickstarter campaign! We've been anticipating this release since Steve first got the rights back late last year, and apparently so have TFT fans; we funded in less than an hour, and continue to blow past stretch goals! We have options for just the classic Melee and Wizard games, the basic entry point to TFT, but we've also added a Legacy Edition. This larger box includes both Melee and Wizard, as well as a host of bonus content, including a ton of unlocked stretch goals like the classic Death Test, large dry-erase megahexes, and more to come. For returning players, this is the best way to relive the game you love. For new players, this is still a great entry point, because it gets you all of the awesome TFT content for a reasonable price. The fun thing about TFT is that the system isn't difficult to play; Steve taught me the basics in our #SJGamesLive series and we were playing in under 5 minutes. Even with multiple fighters per side, it took less than 15 minutes to complete a fight. As players learn those basics, the Legacy Edition allows them to add more to the game – more spells, more monsters, more everything. There are even more surprises to come, so join us on The Fantasy Trip as we revive some quality old-school roleplaying!